The attached video quickly went viral on Tuesday afternoon, with furious comments being directed towards the UPS driver. The videos were taken on Tuesday on 47th Street between New Utrecht Avenue 12th Avenues. The viewer will see an East Midwood Ambulance trying to get down the street as they were transporting a patient to Maimonides Hospital during today’s snow storm. For nearly 40 seconds, the UPS driver – who was inside his truck – failed to move his vehicle, despite the sirens blaring directly behind his truck. 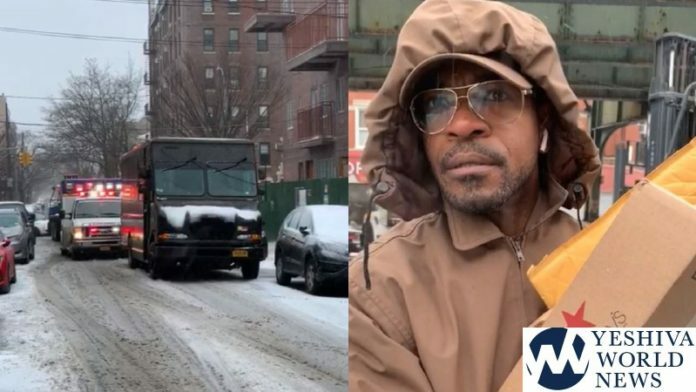 The second half of the clip shows a local resident confronting the UPS driver further down the block as he was carrying packages to be delivered. The resident moves out of the way, and the driver turns around and says “keep in mind, if you post that or send that, you will get a lawsuit”. He once again turns around as he walks away to warn the resident that he will face a lawsuit if the footage gets released. The resident seems unfazed and is heard saying “You will get the lawsuit. UPS will get the lawsuit. What you did was very wrong. You are putting your business before someone else’s life”. UPS received multiple complaints on Tuesday, with many sending the video to the company. Meanwhile, it is interesting to note the number of traffic violations this truck has. #NY_88630MD has been queried 1 time. Beyond unbelievable…..Kol hakovod to whomever recorded the event and all those who reported to UPS> Not only should he be fired but hopefully the Brooklyn DA can find a basis to charge him that if convicted, will put him in jail. The impunity and arrogance in the face of a life threatening situation is maddening. He was hoping not to get filmed. This guy should be fired ASAP. This driver has no respect for human life; At the same time, NYC streets have no amenities for proper parking for large vehicles making deliveries, which is a separate and very intricate topic in its own right. But NYC traffic wardens also don’t care. since they never give tickets to US postal trucks parked illegally. Amount of tickets means nothing. It’s the cost of doing business in this over-developed city. Unless you’re the USPS of course. They get a free ride. The driver did absolutely nothing wrong. He’s no different then the peleg chevra in israel ,who block buses cars and ambulances on streets and hiways. He has some good teachers from the holyland it seems. I think it’s unfortunate that the driver is Black. Now we get a free new anti-Semite if he loses his job. UPS actually has negotiated rates with NYC. They play a flat fee yearly, and for many violations they pay $0. For others there is a negotiated fixed rate of pennies on the dollar. That’s the only way they can do deliveries in NYC. Other commercial operators get this rate as well. Only regular people pay full price for parking violations. T2T: Agree as to the Peleg hoodlums but complaining to Peleg management is not an especially productive endeavor and posting here as to the latter is even less productive since some posters actually agree with their madness. The US Postal Service is owned by the Federal Government and their trucks have Federal government license plates. Government vehicles are generally not ticketed because if they don’t pay the city can’t seize Federal vehicles. complain, but rather to put things in prespective. Sometimes one must shine a strong flashlight to illuminate entire picture. Actually, the point both of you were after was to bring up a piece of Lashon Hara against a group of Chareidim in a story that has no shaychus to them. I strongly disagree with their tactics as well. But right now, there is nothing happening there. Firstly it isnt loshon hora by any stretch of the imagination . Those who block teaffic have a din of rodfim. There is nothing happening in bp either, so why are u even commenting. Am I missng something here? The UPS truck clearly had nowhwere to go, with the snow and cars parked on either side….there was plenty of space for the ambulance to go around. You can even see tire marks in the snow of other vehicles that had done so. “Good Samaritan” making a point to confront the driver with nonsenical questions and spreading the video would be better off handing the video over to the ambulance company and let them deal with it themselves if they felt they were actually hindered from reaching an emergency. Congratulations you have now created one more individual who will spend the rest of his life hating jews with a passion and making sure to spread it wherever he goes. Midwesterner….I think T2T’s point–which I agree–is that its NEVER appropriate to disrupt or obstruct the movement of emergency vehicles no matter what the motivation. There is obviously No comparison in the factual predicates. Here, the UPS driver in the video was either blocking the vehicle out of spite for some reason or his own laziness while a life was at risk (since he had no way of knowing the status of the patient being transported). I don’t think the ambulance was affiliated with Hatzalah (or no markings are visible in the video) so its not clear there was any anti-Semitic motive. In fact its a Kiddush hashem that the frum guy in the video was not afraid to speak out against the driver whose behavior implies a certain lack of rationality. He was not intimidated and stood his ground. @gadolhadorah and “T2T” your ONLY point was and always is to bash chareidim and to connect unrelated stories to chareidim. The fact that peleg shouldn’t be doing what they do was a far fetched connection to this situation and nobody on this website drew such a similarity except for you two. You constantly attack ALL factions of chareidi life no matter what they are doing and this example is no different. -An ambulance transporting a patient with lights and sirens shouldn’t have to perform a tight maneuver in order to avoid inconveniencing a UPS driver making deliveries.